It's that time of year again. Harvest Moon season. And it's been quite a year leading up to this weekend. And then Gavin's family's wish for "Harvest Moon" was fulfilled in Dublin, Ireland. So celebrate the Harvest Moon this weekend. The Harvest Moon is said to come before or after the autumnal equinox. It is simply the full moon closest to that equinox. About once every four years it occurs in October (in the northern hemisphere), depending on the cycles of the moon. 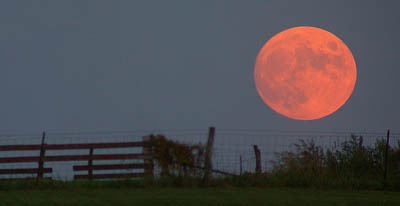 Currently, the latest the Harvest Moon can occur is on October 13. Often, the Harvest Moon seems to be bigger or brighter or more colorful than other moons. These effects have to do with the seasonal tilt of the earth. The warm color of the moon shortly after it rises is caused by light from the moon passing through a greater amount of atmospheric particles than when the moon is overhead. I will be spending the Harvest Moon with Neil. I'm leavin for St Louis tomorrow. I live in Ohio so i got a bit of a drive...can't wait! Does anyone know the song's origin? Did he have a specific person in mind when he wrote it? Neil repeated the story of Old King many times but I don't recall him ever talking about Dreamin' Man. I think it's just a collection of contrasting thoughts that juxtapose some feelings and observations. I think he's smiling and kinda laughin all the way through it. Very light in a world of heavy. Self amusement looking straight in the mirror. The varied thoughts of heart and mind. Thanks for your thoughts SONY, but what do you make of the line "with a loaded gun and sweet dreams of you"? Makes me think the song might be about a stalker/killer but describing him merely as a "dreamin' man" seems unduly kind. The reference to Club Med Vacations makes me wonder if Neil was reacting to a specific incident that he heard about or maybe someone he knew. It's a great song but I've always found the lyrics perplexing. Maybe he's roll playing a couple different guys (or 'everyman') dealing with their ladies and the stray thoughts that sometimes come over them. That loaded gun should really be in the window of a pickup. But the aerostar connotes a 'family man' to me. Past Club Med Vacations is probably the last store on the corner corncorse at the mall, now he can't see her.